Ash Hunter believes he has proven himself after being one of the players to have benefited most from John Sheridan’s Highbury stay.. The 22-year-old was used mainly as an impact player during Uwe Rosler’s time at the club, getting a regular run of games just before the German was sacked from his role in February. The forward has started every game under Sheridan but rarely in his natural striking role, having played as a wing-back or on the left wing during last Saturday’s defeat against Wigan Athletic. Having penned a new deal that keeps him at Town until 2021, Hunter wants to end the season with a double-figure goal tally after reaching eight so far this season. He said: “My best position for me is as a number nine, a striker, but I’m happy to play anywhere and get minutes. “It is what I need and I think with the minutes I have got recently my fitness has got better and I have proved I can play anywhere. “The second half of the season has been good for me. “I played the majority of games from the start and I’ve played a few 90 minutes, scored a few goals and played in various positions. “But signing a new contract has been one of the best things for me this season. “For the club to put that time and effort into me and for me to repay it with that is good. “I have proved I am more than an impact player. “In the second half of the season I’ve played the majority of the 90 minutes, especially since the new gaffer came in. “The only time I got subbed off was on the weekend. 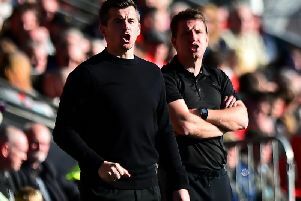 Hunter is sad to see Sheridan go with Joey Barton set to take over from the ex-Oldham man on June 2. However, he is hopeful that Barton got a glimpse of what he is all about when he watched the Wigan game. He said: “I’m just taking every day as it goes; I’m just doing my best to make sure I’m on the pitch on a Saturday and, when I am on the pitch, making sure of getting the results. “There is that pressure with the new manager being there last Saturday but I though I played OK.
“I always put 100 percent into every game and you aren’t going to get less from me. “Now finishing high up in the table is the priority.